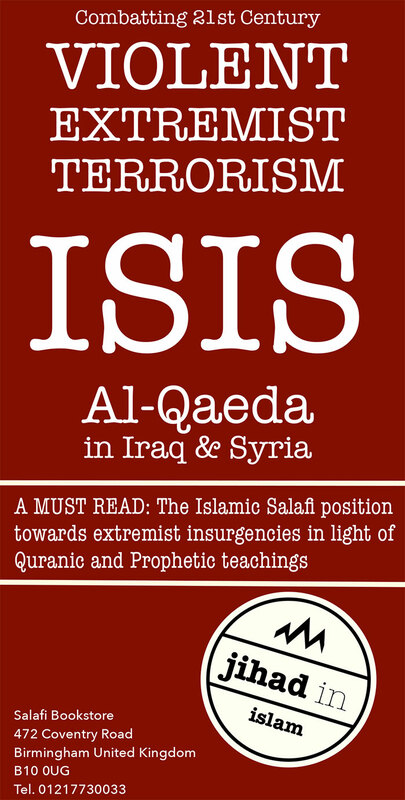 Collect some FREE from the Salafi Bookstore (once printed). If you live in the UK, please contact the Salafi Bookstore on 01217730003 and get a few hundred or a few thousand high quality leaflets printed for your locality, school, college or university. The printing cost is approximately £45 per 1,000 delivered to your door in the UK. Email: admin@spubs.com for more details. If you have authority or responsibility in a Mosque, Islamic Centre, Islamic School, Community Centre, university or college prayer room, etc, download the flier to a small USB drive, take it to your local “Staples” or any other stationary store and get each side printed off at A3 or A2 poster size and then laminated. Then place it somewhere prominent in your Islamic Centre, so others can benefit. Donate towards printing these leaflets by Paypal (click here) or calling 01217730033 with your debit card details. Forward this link to whoever you think will benefit. Forward it to news agencies, media companies and academics. USA and Canada, please contact our brothers and affiliates at Troid.Ca and SunnahPublishing.Net – they may be able to help with printing.